Ladies and Gents - I have a confession to make. I am seeing another blog. Don't worry - I am not cheating on you. But rather, I am moonlighting as a freelance blogger and have just been posted on NAXOS for America's blog. February, being Black History Month, is a time for us to take pause and look back on the leaders and events that helped to shape our current racial climate - a climate that made it possible for our country to welcome its first African American president. To that end, The intense, velvety voiced influence of Grace discusses the legacy of African American opera singers, but more specifically calls out the legacy of one in particular - why, Grace Bumbry, of course! One thing that largely goes un-noticed about the Civil Rights Movement is the artists that helped shape a legacy. It is a legacy whose path was set out by legendary contralto Marian Anderson. Anderson was thrust into the international spotlight after the Daughters of the American Revolution refused permission for her to sing in Constitution Hall. At the insistence of First Lady Eleanor Roosevelt, Anderson was invited to sing an Easter Sunday concert on the steps of the Lincoln Memorial in 1939. The crowd that assembled for the concert numbered above 75,000 and the radio audience that listened to the concert numbered in the millions. 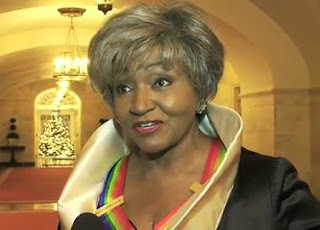 For more, including Grace Bumbry's ground breaking performance that shattered the racial boundaries of a well known opera house, hop on over and visit NAXOS for America.